As technology keeps evolving, so do the workstation configurations that ensure your CAD users can work efficiently. Get up to speed on what you'll need to purchase this year before you approach your boss for approval. 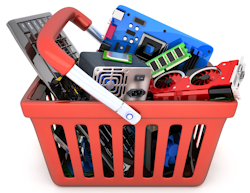 We may be in a brand-new year now, but there are two things that never seem to change: I get a lot of questions about minimum specifications for CAD workstations, and senior management or the IT folks always want to buy something cheaper than those specs. In this edition of the CAD Manager's Newsletter, I'll lay out my 2019 recommendations for CAD workstation configurations, and explain how I arrived at them — in a way that your boss and IT department can understand. Here goes. The first factor to consider for most CAD programs (think Autodesk AutoCAD, Civil 3D, or Revit; Bricsys BricsCAD; Dassault Systèmes SOLIDWORKS, etc.) is that selecting a processor is more about frequency (clock rate) than anything else, because these programs run primarily on a single core. Given this single-core affinity, it is better to have fewer, faster cores than more, slower cores. If you explore processor options, you'll see that as more cores are packed on a single processor, those cores will tend to run more slowly. You'll also notice that each new generation of processors tends to have higher frequencies, as well as a few more cores than the previous generation. The second thing to consider is that processors have a base frequency that pertains to all cores, and a maximum Turbo Boost frequency that can be achieved by a single core. So, if we consider that other applications besides CAD are also running on the computer (think office applications, rendering tools, analysis modules, etc.) we can see that the best processor/core combination will have the highest base frequency for all cores and the highest Turbo Boost on a single core. For example, it would be better to have a 6-core processor at a 2.9-GHz base frequency that Turbo Boosts to 4.8 GHz than a 6-core processor at a 2.2-GHz base frequency and a 4.2-GHz maximum Turbo Boost. Finally, only processors with high amounts of cache and hyperthreading should be considered. That rules out i5 processors, leaving the highest-frequency Intel i7 and Intel i9 processors, with the latter being preferred. Minimum purchasing recommendations: An Intel i7 8XXX series processor would be considered the absolute minimum at this time, but the Intel i9 9XXX series processors provide six or eight cores running at higher base and Turbo Boost frequencies, earning my vote for minimum. These processors are faster (for higher productivity right now) and more capable of handling more complex workloads (for updated software later). And if you're intending for a workstation to last for three years or more, doesn't it make sense to buy something that has the latest technology today? NVIDIA is offering a four-part series of guides that explore how product development is changing, its challenges, and the new technologies being developed to transform design workflows. Registration is required to access the digital guides.